Social media started as an entertainment tool and evolved to a powerful marketing tool. While serving its primary purpose of connecting people, social media also plays a major role in connecting marketers with customers. Social media marketing is on the rise, as this type of media gains importance in the industry and shows potential for further development. Investments in social advertising worldwide are forecast to grow from around 32 billion U.S. dollars in 2017 to approximately 48 billion U.S. dollars in 2021. The United States is, by far, the largest social media advertising market in the world, as more than 14.8 billion U.S. dollars were spent on social media ads in the country in 2016 alone. Facebook, the leading social network in the world, is the most used social network for marketing proposes. The platform was also chosen by majority of the marketers as the single, most important social platform for their business. Twitter and LinkedIn were also popular amongst marketers, with respectively 62 percent and 56 percent of marketers affirming using these platforms. This preference for Facebook has a direct impact on the company’s total revenue considering advertising is the main source of their revenue. 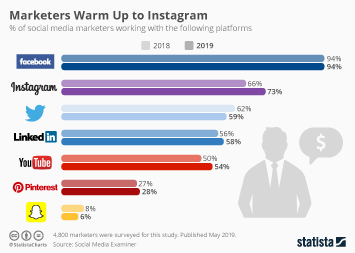 What si more, Facebook's Instagram is also gaining traction among marketing professions, out of whom 66 percent indicated plans of increased usage in their promotional strategies. The majority of marketers see the success of social media as an important part of the overall marketing objectives of a company. Along with more traditional digital approaches and channels such as email marketing and content marketing, social networking marketing is considered one of the most effective digital marketing channels for customer retention in the U.S., a key objective of branding and marketing strategies. Marketers particularly turn to social media marketing to increase their audience engagement and brand awareness, as well as generating leads and sending traffic to the website. These are just a few of the leading social media marketing objectives. Global marketers also mentioned other benefits of using social media for marketing purposes such as providing marketplace insights, improving search ranking and improving sales. Despite the rise of social media marketing, there are still challenges in measuring the results of this particular type of marketing investment. Thirty eight percent of marketers are uncertain if they are able to measure the return of investment (ROI) of social media activities. What is more, about half of global marketers point to social media as the most difficult digital marketing tactic in terms of execution. However, all in all, more than 60 percent of industry professionals worldwide strongly agree that social media is important to their business.